Kenmare News | 100 years young! Congratulations to Elizabeth Sheehan on reaching the wonderful age of 100 years! 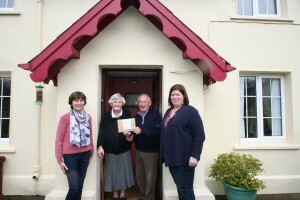 Elizabeth has been a customer of Sean Daly & Co for over 40 years and is pictured with Sean Daly and staff members Mary O’Farrell & Grainne O’Driscoll as they presented her with free renewal of her Household Insurance Policy for 2019.